Ms. Dietrich was on her way to Europe for a vacation. "FOR DOMESTIC CONSUMPTION IN EUROPE"
Sir Percy Bates, chairman of the Cunard Steamship Company, told the annual meeting of shareholders in Liverpool yesterday that he discounted heavily war talk from abroad. "I think most of it is part of the technique evolved as necessary to certain types of foreign Governments," he continued. "The men in the saddle find it necessary to continue to say things to the horses simply in order to remain in the saddle. If what they say is overheard by other countries, and commented on, it all gets back to the horse, and the rider is so much more the secure. "I do not believe there is a nation in Europe or out of it that wants to go fighting for adventure to-day. I think that all this war talk is for domestic consumption only." Sir Percy Bates added that the great feature of the year had been the coincidence of the arrival of the Queen Mary with a period of improving traffic across the Atlantic. 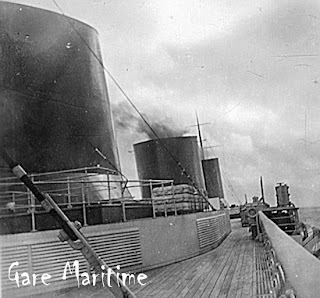 The Queen Mary had demonstrated her quality as a profitable ship in a satisfactory manner. The remaining ships had earned figures substantially in excess of their previous year's earnings. It was proved that the advent of the Queen Mary had been helpful to the rest of the fleet. The result of the year was a credit of 546,000. In 1935 there was a debit of 61,000. Referring to the profits tax, Sir Percy Bates said that this, or something like it, was quite sound in theory. He felt confident that when the Treasury White Paper was transferred, first into a Bill and finally into an Act, it would do what the Chancellor wanted. 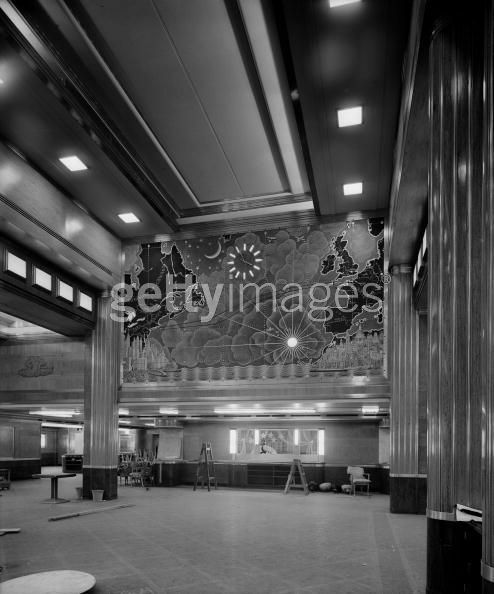 SOUTHAMPTON, Eng., April 28, - (AP) - Britain's sea queen, the Queen Mary, sailed for New York today with a new face on the wall of her main companionway. Stewards took down a portrait of the Duke of Windsor. 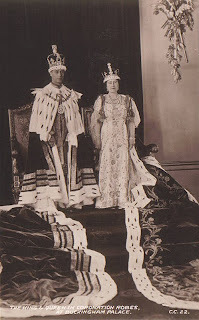 In its place they hung a signed portrait of King George VI and Queen Elizabeth. 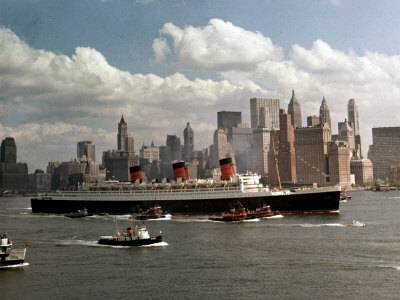 The Cunard White Star liner Queen Mary sails from New York today for Havre and Southampton. 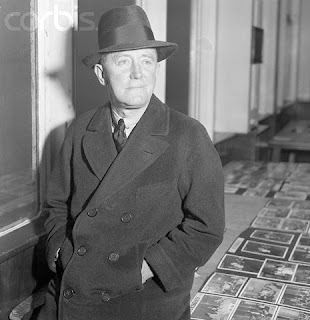 Among passengers will be Paul Vincent Carroll, author of the successful play, "Shadow and Substance"; C. Ross Somerville, champion Canadian golfer, en route to tournaments in England; A.B. Purvis, president and managing director of Canadian Industries Limited; C.G. Donaldson, of the Donaldson Line. sailing this day in 1952 aboard the RMS Queen Mary. 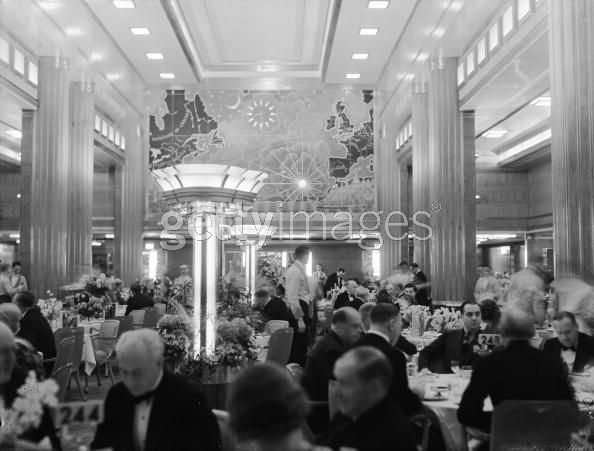 Charles G. Johnson, known to thousands of Americans as purser of the Mauretania, has been appointed to the important post of chief purser of the new superliner Queen Mary, announced the Cunard White Star Line, yesterday. Mr. Johnson will be in full charge of the business end of the ship's activities when the big vessel arrives for the first time in New York harbor on June 1. Like all other officers of the Queen Mary, Mr. Johnson has had extensive experience, although at the age of 53 he is still a comparatively young man to have reached the top of his profession. He first joined the Cunard Line 35 years ago as a clerk in the accountant's department at the head office in Liverpool. ...it was understandable why he slipped away for quiet drives in the afternoon or to a hideout in the mountains up in Maryland. At least once he was able to shake off the Secret Service men who hover over any president. He saw the summer sky clearing after a heavy rain one afternoon at Hyde Park and ordered up his own blue touring car, a light car specially equipped with hand controls for brakes and clutch. Mr. Roosevelt made a bee-line for the swampiest part of his 1,100 acres. 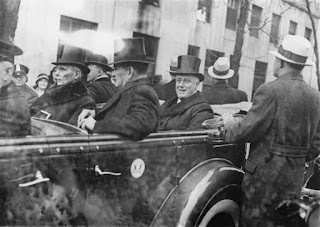 The long heavy Secret Service car - so big and powerful it was called "the Queen Mary" - bogged down. The last its occupants saw of the Chief Executive for a while was a delighted grin. Mr. Spinney returned from England in the Queen Mary. He said the ship carried about 2,000 British-born American brides and nearly 700 children who were en route to new homes in the United States. "The Red Cross, under whose guidance these young women and their children were being transported, are doing splendid work," Mr. Spinney said. "Each day aboard ship the brides were instructed in the mannerisms and ways of life they would meet in their new land." Although they were to become Americans, Mr. Spinney said, their American Red Cross instructors told them never to forget England. Spencer Tracy and wife Louise Treadwell. 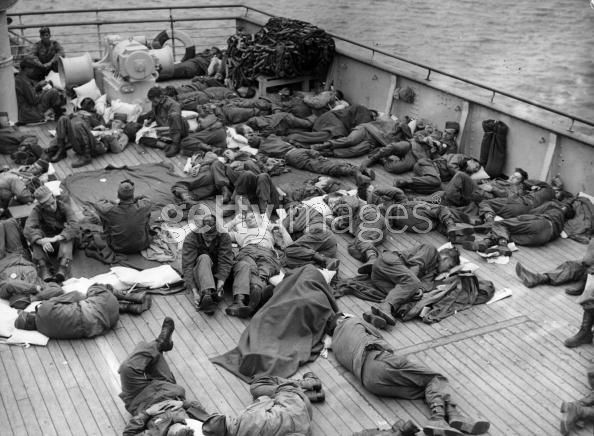 They're pictured here as they boarded the ship for England. Southampton - (C.P. - Havas) - Great Britain's film industry will experience a big business boom, Samuel Goldwyn, Hollywood film producer, predicted today as he boarded the Queen Mary for New York. 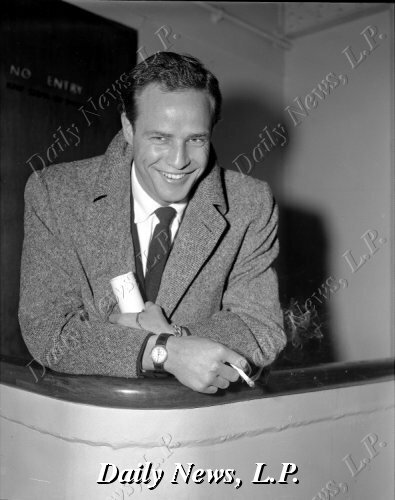 "The cinema industry (in England) will be more prosperous than ever," he said adding he wished American prospects "were so good." Mary Pickford, [pictured shipboard the previous spring] also New York bound on the Queen Mary, declared she is planning to direct a film in Britain. Kenneth C. Wickel, of 1018 Green St., who was recently discharged from the army as a sergeant, is awaiting the arrival of his English wife, the former Tilly Hyatt, of Hanley, Stoke on Trent, a passenger on the Queen Mary. The ship is expected to dock in New York tomorrow. Wickel, who was in the service 42 months, met his wife while he was stationed in Staffordshire with the air corps. They were married on June 10, 1944. A son, Kenneth William, 14 months old, is making the trip with his mother. Wickel, who is employed by a Penn Street store as a baker, will be in New York to meet them. He lives with his mother at the Green Street address. 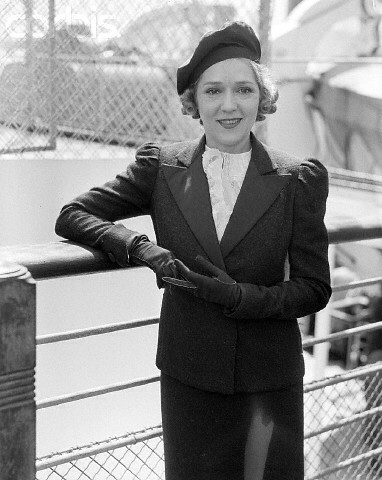 Coloratura soprano Anna Maria Alberghetti was aboard the Queen Mary on this day in 1950, sailing for America and her debut at Carnegie Hall. 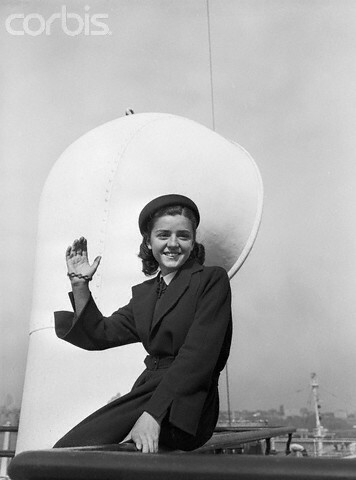 She is pictured here as the Cunarder arrived in New York. 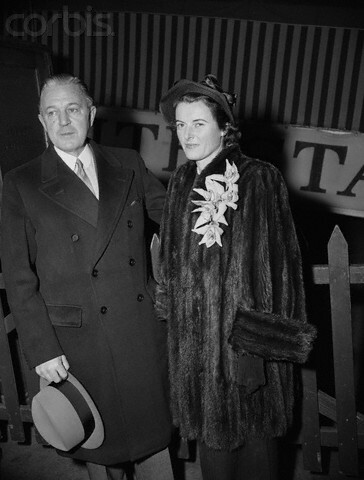 Pictured: On this day in 1949, prominent Pittsburgh banker, Richard K. Mellon, and his wife arriving in New York on the Queen Mary after a vacation abroad. 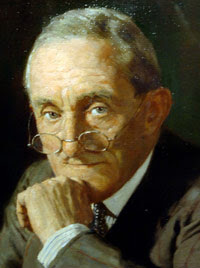 Mr. Mellon was the nephew of Andrew Mellon, ex-Secretary of the Treasury and founder of what would become, after merging with Carnegie Institute of Technology, Carnegie Mellon University. 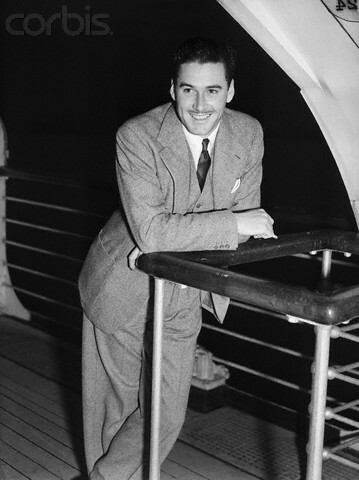 Errol Flynn was aboard the Queen Mary on this day in 1937. He is pictured here as the ship arrived in New York. Thornton Perry, salesman for the Jefferson Motor Company and a World War veteran, has returned from a trip of three months abroad, arriving in New York aboard "The Queen Mary" on Saturday. Although visiting ten countries including the British Isles, Mr. Perry took special interest in France and Belgium where he served as an aviator with the A.E.F. during the World War. 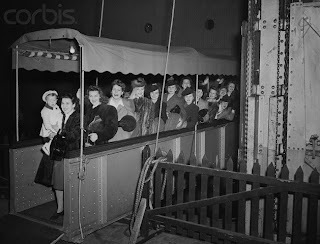 NEW YORK, April 14 (UP) - A group of 39 British women fanned out over the United States and Canada today to visit their war-bride daughters. 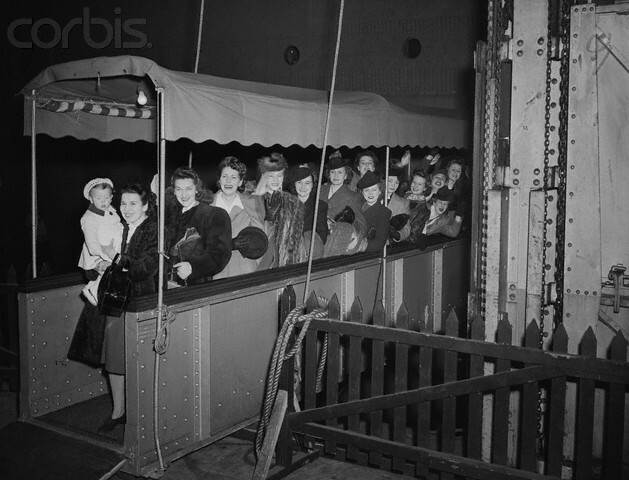 Many of the women, who arrived aboard the Queen Mary, were seeing their daughters for the first time in nine years. Mrs. Bertha Corker of Southsea, Portsmouth, said the women from her community had been saving pin-money for years to pay for their trips. Those two new giantesses of the sea, the Queen Mary of England and the Normandie of France, will be quite different in appearance. The Queen Mary will have the familiar knife-edged bow, while the Normandie's bow will be very bulbous. 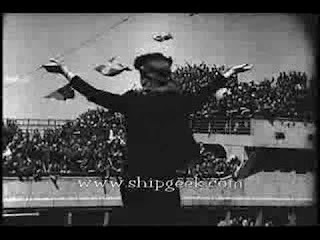 The marine engineers studied bows thoroughly. 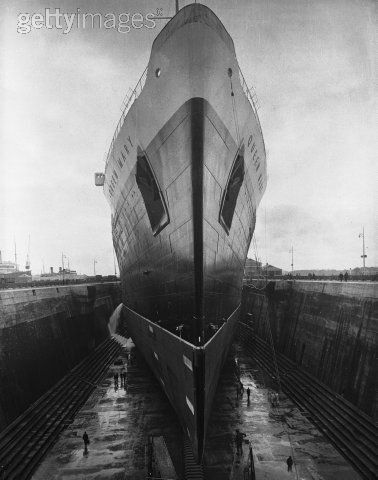 For each ship, elaborate tests were made to find out which type of bow would be more satisfactory. Model ships were launched in miniature but tempestuous laboratory seas. Conditions in the testing tanks duplicated on the proper scale the most severe Atlantic storms. Then the English engineers chose one bow and their French fellows another. Perhaps the best laboratory, after all, will be the actual voyagings of the two huge ships. We'll know which batch of marine engineers was right was right when we see which ship future boats are modeled after. 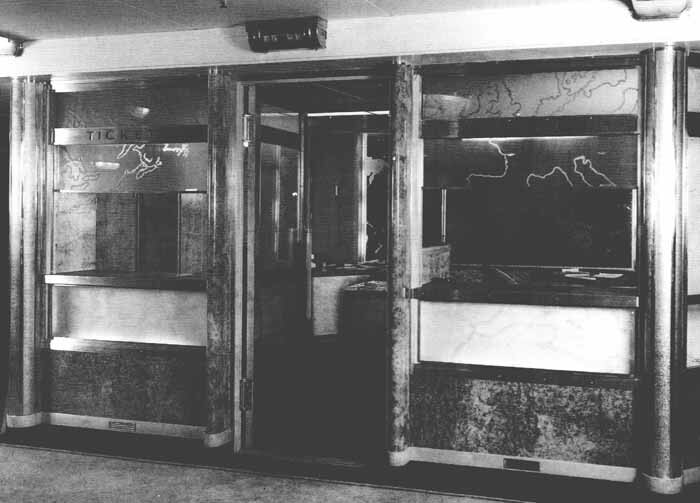 "Book early is the best advice that can be given to the prospective traveler this year," advises F. J. Francke, local steamship agent. "It seems," he continued, "that if people do not book early, some of them will not book at all. Transatlantic travel will hit a high stride in May, while June will find all ships filled on sailing day. The only way to be sure of going abroad in the height of the season is to book early. This is the proper way to plan for a European trip. "The prospective traveler sometimes has the mistaken idea that traveling by ship is like traveling by train, that "there is always room for just one more." Another car can be added to a train, but a ship has no trailers, and if you don't have a reservation, you just don't go. "Present indications point to a very successful travel season this year. Veteran travelers are booking up for Europe and a great many new ones are asking questions about where to go and how to get there. "I believe the Queen Mary is going to create a spurt in transatlantic travel. She will make her first sailing from this side on June 5th, and will sail every two weeks thereafter. The demand for space on this great ship is unprecedented. Her running mates will be the Berengaria and Aquitania, both very popular ships. "To get back to the book early idea: school teachers and students set a good example in this respect. They are already booked, not only here, but throughout the country. Many have paid only a deposit, not full fare, but they have their rooms and will have no travel worries to bother them for the remainder of the school term. "In booking passengers there is no playing favorites. It is truly a case of 'first come first served' . The best available staterooms may be had for the asking. Thus early bookings mean better accommodations. The best rooms go first, naturally. "Finally, I would say: It is too bad to plan for a year to take a trip to Europe, and then wait a week or two before sailing time to buy tickets. To avoid disappointments, book early." An agreement between the Cunard White Star Line and the French Line in respect to the sailings of the Queen Mary and the Normandie, new flagships of the respective fleets, is reported to have been ratified. The joint schedule will be issued when the Queen Mary enters the North Atlantic service. The Normandie makes her maiden voyage from Havre for New York May 29. The death at his home, Willifield Way, London, N.W., of Mr. Kenneth D. Shoesmith, the marine painter, was announced yesterday. He was 48. Mr. Shoesmith was educated in the training ship Conway. For several years Mr. Shoesmith was an officer in the Mercantile Marine and sailed to many parts of the world. 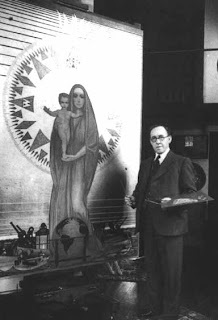 His artistic inclinations were dominant, however, and after the war he left the sea to take up painting. He exhibited at the Royal Academy and the principal galleries. His chief works were the immense canvases which panel the public rooms of the Queen Mary. The subjects illustrate the romance of seafaring and British naval history. UTICA, N.Y., April 9. (AP) - Utica police were searching today for an English war bride whose husband reported she had left a note saying she was going away with another man. William F. Clark, a gasoline station employee, told police that his bride, Mary Walker, 18, of Snibson, England, left a note at the hotel where they were staying informing him she had met another Utica boy, that she "loved him" and was going away with him. 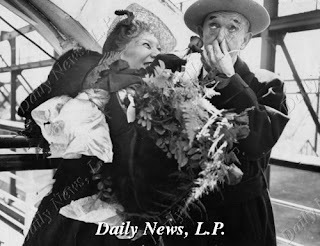 Mary arrived in New York Thursday on the Queen Mary. 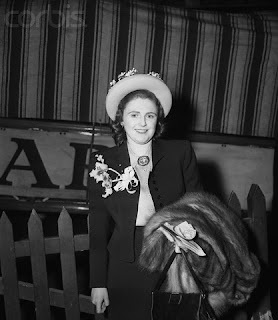 On this day in 1946, Pamela Churchill, daughter-in-law at the time of Winston Churchill, was aboard the Queen Mary. She was one of 820 non-military passengers on their way to England. The British-born socialite, shown here boarding in New York, became best known as Pamela Harriman, political activist for the Democratic Party and ambassador to France under the Clinton administration. 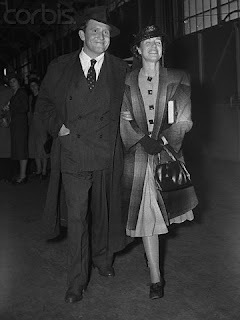 Stan Laurel minus Hardy (paired instead with wife Ida). LONDON - There will be 596 clocks on board the Queen Mary. All will be electrically controlled from two master clocks on the bridge. They will be "half minute jumpers" - that is to say their hands will move forward every 30 seconds. The clock in the ballroom will disguise a loudspeaker, and one at the entrance to the first-class main deck shows the time by means of a ribbon looking like a speedometer tape in a motor car. The 370 clocks for first-class cabins have handsome six-inch square faces in silver, with hands and figures in black. The 70 clocks in the public rooms will be designed to suit the decorations in which they have to fit. A map, 24 feet 6 inches by 18 feet, is being made for the Queen Mary, representing the Atlantic ocean. From Biship's Rock to the Nantucket lightship, a three-inch illuminated crystal model of the ship will travel along a 16-foot track, always marking the exact position of the ship. 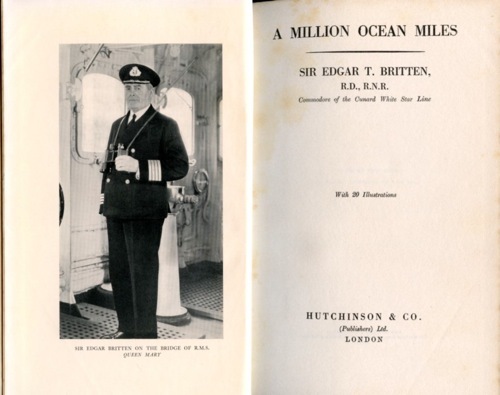 3 CAPTAINS TO SERVE ON LINER QUEEN MARY; Gibbons and Davies to Assist Sir Edgar T. Britten Who Will Be Master of Ship. Mr. Llewellyn Roberts, C.B.E., former chief engineer of the Cunard White Star liner Queen Mary, died yesterday in Edinburgh. He became ill suddenly yesterday morning in travelling from Edinburgh to Clydebank. His death is a loss not only to the Cunard White Star Line but also to the British Mercantile Marine, of which he was such a distinguished engineering officer. He was well known on the Clyde having been in residence at Clydebank for some time while the Queen Mary's propelling machinery was under construction by Messrs John Brown and Co., and since August last year he has been the Cunard White Star Line's chief engineer on the construction of the Queen Elizabeth's machinery. He sailed on the Queen Mary as chief engineer during her maiden voyage, and would perhaps have been in the same capacity on the maiden voyage of the Queen Elizabeth, which goes into service next year. Mr. Roberts has served the Cunard Company for some 35 years, and before taking up the position of chief engineer of the Queen Mary he held the corresponding command on the Berengaria from 1931 to 1934, while in the five previous years he was chief engineer of the Acquitania. He was educated at the Collegiate School Llandudno, and after preliminary training in engineering he joined the Cunard Steamship Company in 1904 at the age of 23. He subsequently had sea-going experience on the Ivernia, the Lucania, the Caronia, the Mauretania, and the Lusitania. 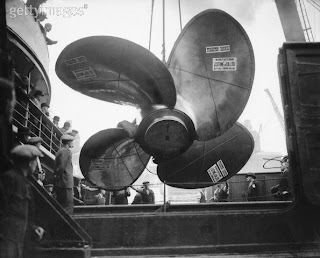 When to those ships are added the other Cunarders Aquitania, Berengaria, and Queen Mary, on which Mr. Roberts held responsible positions, it will be seen that few engineering officers in the Merchant Navy have performed such an achievement. Photo: Getty Images: Queen Mary's fourth propeller being hoisted onto the steamship Bradda at London Dock, on its way to Glasgow. Cary Grant is the very model of modern major romantic idol. In film he is the ultimate in urbanity. Incredibly, in real life he has acted the bashful sailor...the actor confesses in a mag that Merle Oberon once john-aldened for him. He asked her to approach Betsy Drake on the deck of the Queen Mary. While Grant hid in the nearest companionway she invited Betsy on his behalf to join them at lunch. Grant concludes the story with a not-so-happy ending. "That was how, in 1947, I met the dear wife who recently divorced me." ...But for our money the best story we heard didn't happen today, but yesterday. It came out of West Leesport, where a party of Readingites drifted into the drug store to stock up on some ice cream after searching the stores of Lake Ontelaunee in vain for the Queen Mary, pictured in yesterday's Eagle as being moored there. That picture was a composite, a photographic trick worked out in the dar kroom.